Since 2014, it has been clearer than at any point in time since the collapse of the Soviet Union - the Cold War never really ended. But is it still a cold war? Russia's invasion and annexation of Crimea was a flagrant violation of the norms largely respected since the end of the Second World War. The ongoing insurgency there is an escalation in Russia's attempt to halt the expansion of the NATO alliance. It invited sanctions targeting key Putin allies, imposed by the United States, Canada, the United Kingdom, and other core Western allies. Russian interference in Eastern Ukraine is just one theatre in Russia's hybrid war against Western interests. Increasing Russian activity in the Middle East is undermining Western and American interests in several Arab states, most notably in Syria. Russia's Iranian ally is gaining control in Iraq, increasing influence in Syria, and bolstering its Lebanese proxy-ally Hizbollah. The most controversial Russian operation in the United States over the past year has indisputably been its meddling in the 2016 election. Whether or not the Trump team bears any responsibility, there is no doubt that the Russian security services were active in influencing American public opinion in the run-up to the 2016 Presidential Election. Similar interference has been recorded in other Western democratic processes, like France and Germany. Outright fabrications in at least all three countries were used to propagate lies about candidates who promised to stand up to Russia. In Hillary Clinton's case, her experience as Secretary of State under President Obama solidified her antagonistic relationship with Vladimir Putin and his government. At the very least, Donald Trump, with his perceived openness to ease Russian sanctions and look the other way on Russian interference in Ukraine, was an infinitely more attractive option for the Putin government. But even the 2016 election meddling is only a part of Russia's information campaign in Western countries. Disinformation has thrived since Russia learned to weaponize social media as an effective propaganda tool. Facebook, Twitter, and other platforms have been coopted as mediums for the infamous "fake news" that Donald Trump is always mentioning. However, the fake news isn't coming from the mainstream outlets. Publications like Breitbart and InfoWars have flooded the environment with false stories about Obama, the Clintons, the "deep state," and the "liberal" media. Alex Jones of InfoWars regularly broadcasts his theories about Democratic politicians, often involving religious symbolism. Demons, aliens, and the Antichrist are popular themes in his radio show, where Donald Trump has appeared as a guest. These American outlets, wittingly or unwittingly, share misinformation with their millions of viewers. Julian Assange and his organization, Wikileaks, were instrumental in leaking documents detrimental to Clinton and the Democratic Party, while suspiciously silent when it came to Republican and Russian wrongdoings. This, combined with key Trump advisors' apparent foreknowledge of Wikileaks releases, is part of a pattern that suggests Wikileaks was, at best, aligned with the Trump campaign during the election. More importantly, the strategic effects of Wikileaks' media operations in relation to the 2016 Presidential Election are consistent with the assessment that the organization is, at the very least, an unwitting agent of Russian intelligence. Every intelligence agency within the United States Intelligence Community agrees with the assessment that Russia was active in interfering with the American democratic process in 2016, but President Trump won't acknowledge their conclusions - why? Mueller and his team are likely close to the answer, as Trump and his allies continue their smear campaign against the FBI. The American Intelligence Community's assessment of the 2016 Presidential Election must not go unnoticed. If America's enemies' intrusions go unchallenged, they will act smarter and bolder in future elections in Western-aligned nations globally. The Russian hybrid war against the West must be recognized and challenged. Infringements on Ukrainian territorial integrity must be punished, and the West must support its liberal democratic allies around the world. Russian aggression in the Baltic and Caucasus regions must also be kept in check. A 'Great Power' war, or a third World War, should be avoided, but expansionist and oppressive policies on the part of Russia must be checked by the international community. Western electorates must be guarded against rampant disinformation campaigns, and social media platforms must take responsibility for the foreign propaganda published on their sites. As the internet and social media become more integrated with our daily lives, Russia will surely ramp up its campaigns to exploit them. Democratic nations, in all public and private institutions, must send a resolute and uniform message - undermining our societies and values cannot be tolerated. 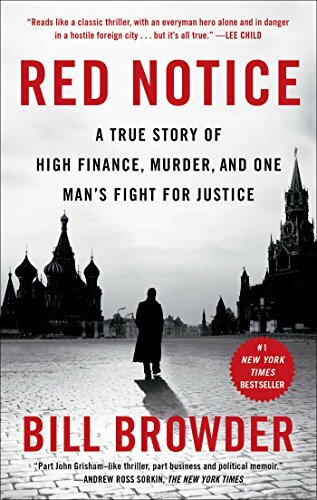 Today's book recommendation is Bill Browder's Red Notice.